VACATIONISTS have never wanted for musical entertainment on their sojourns in out of the way places, for manufacturers have been quick to meet the demand with portable radios, phonographs, and the like. 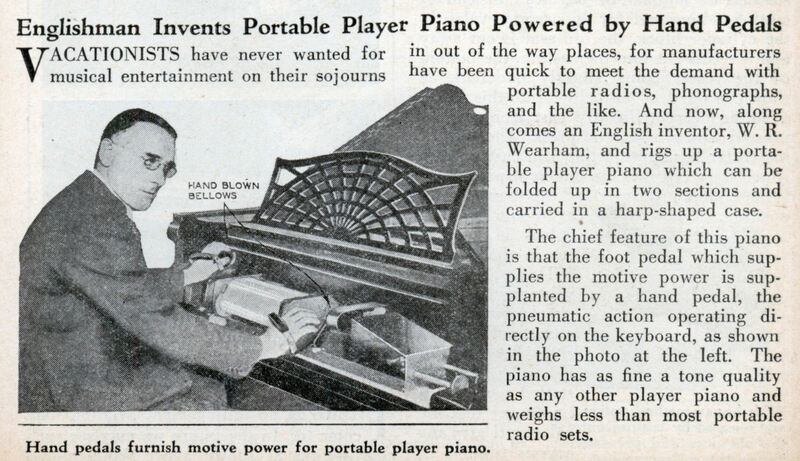 And now, along comes an English inventor, W. R. Wearham, and rigs up a portable player piano which can be folded up in two sections and carried in a harp-shaped case. The chief feature of this piano is that the foot pedal which supplies the motive power is supplanted by a hand pedal, the pneumatic action operating directly on the keyboard, as shown in the photo at the left. The piano has as fine a tone quality as any other player piano and weighs less than most portable radio sets. Is it the piano or just the player part that is portable? From the photo it looks like it clamps over a normal piano keyboard. Its looks quite good,and the feature of this piano was quite different to others.Whatever it is this feature is operating directly on the keyboard. This is an interesting varation on the normal foot-pumped push-up piano player also known as a “vorsetzer” or “Pianola” (the latter an Aeolian trademark) which was the popular precursor to the “inner-player” or normal built-in player piano. There were many of these built, and a goodly number survive today. Some use regular 65-note or 88-note rolls which are readily obtained, while others use harder-to-find rolls such as 65-note Angelus (which is designed to run upside-down and inside-out compared with normal piano rolls), 58-note reed organ rolls, 73-note Phonola rolls (Hupfeld), 65-note Cecilian rolls (which are wider than normal and have an irregular proprietary hole spacing) and probably other types I’m not aware of. 1. They are bulky, heavy, and have to be moved up and adjusted to the piano before playing, and moved away and stored afterwards. 2. They cover the keyboard while playing, so that you cannot watch the keys go down as easily, nor follow along by hand as with an inner-player piano. 2. The push-up, although large and heavy, has a degree of portability, if a proper system of transporation, padding, and moving is implemented. For example, I was recently in St. Louis for the annual Ragtime Rally at the Scott Joplin House. 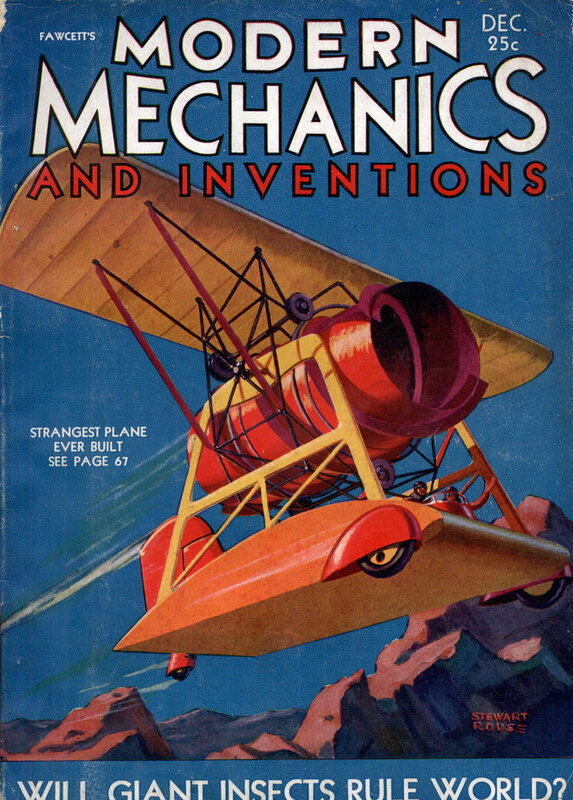 I helped a couple of friends move their 65-note Aeolian Pianola push-up player from their shop into their SUV (padded with blankets), which was then driven a few miles to the House, whereupon we carefully unloaded the heavy push-up onto a dolly and rolled it up the ramp into the house. We used this device with a “modern” 1950s spinet piano to demonstrate one way that upper-middle-class people heard music in their homes during the time Joplin lived in the house (circa 1901-1903). It perfectly complemented the later Kimball “inner-player” adjoining it, which is currently a regular fixture of the house and played regularly on tours. Although moving the push-up to and from the rally was a lot of work, it was not nearly as stressful as if we had been moving an actual built-in player piano, which would have been inordinately large and heavy and is best moved rarely, with a truck, and not to casual functions in the back of a friend’s SUV! The portability factor of the average push-up has been used to great advantage with the regular “pianola concerts” put on by members of the Player Piano Group in Great Britain. They can take their pianolas to large concert halls to use them to concertize on world-class grand pianos. 3. They play the piano in the “natural” way, pushing down on the keys with felt-covered fingers rather than up on the whippens of the piano action (or backs of the keys) as with most “inner-players”. Supposedly this lends a more natural touch to the piano music produced. However, a well-restored and regulated inner-player can sound pretty nearly as good as this and approximate the same kind of touch assuming everything is properly adjusted. In reality, piano “touch”, whether by a person or a device, is the result of three things: how fast the key goes from rest to the bottom (acceleration, which in turn determines the volume of the note), what time this occurs in relation to other notes, and how quickly or slowly the key is released, allowing the damper to work (sustain). I should mention here that both a well-restored push-up with equally restored attached piano, and also a well-restored built-in player piano, are about equal to each other in musical ability when played by a person who is a good pianolist, understands his or her instrument, and can “play” it well.